Whoops. Cricket star Shaun Pollock pants split on live television. Oh. 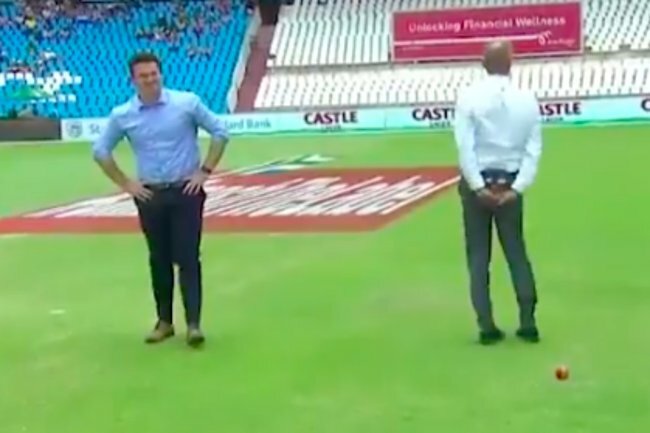 A cricket commentator just had an unfortunate wardrobe malfunction live on camera. Many people are familiar with the nightmare that you’re suddenly stark naked in front of a crowd of people. You’re giving a speech, only to look down and realise you’ve forgotten your pants. Whoops! But for South African cricket legend Shaun Pollock it was… not a dream. The former cricketer was demonstrating a slip catch on day three of the Boxing Day Test at Centurion, when he had a very awkward wardrobe malfunction. In the video, you can see the 45-year-old seamlessly pick up the ball before you hear him say “That’s a split”. He continues to turn around to showcase the split pants to precisely… everybody watching at home. He handled it like a total champ, even taking to Twitter to acknowledge the incident. “Thanks to the Proteas change room for the replacement pants , no more slip catching displays in suit pants!” he wrote in the tweet, alongside a photo of him in some sparkly new slacks. Somebody buy this guy a beer.